Paramotoring is a little-known but fast-growing adventure sport. Similar to paragliding, the activity takes you flying across the sky, except the glider is now powered with a large propeller. This short paramotoring trip in Vizag gives you a taste of this new thrill with a 10-minute flight over the Rushikonda Beach. As you glide over the clouds at an altitude of 700 feet, you'll fly over the ocean, looking at the city on the horizon and the beautiful Bay of Bengal below you. A certified paramotoring pilot will accompany you at all times, so all you need to do is sit back, relax and enjoy! Paramotoring over the Rushikonda Beach gives you an exciting chance to try out a thrilling, new adventure. The winds sweeping the Bay of Bengal at Vizag create some of the best conditions for aero-sports like paramotoring. Flying over the sea, you can see the tidal waves crashing into the beach and a sole mountain cliff rising above ground near the beach. • Enjoy a paramotoring flight going over 700 feet above ground. • Glide through the sky like a bird for 8-10 mins. • Try out the thrilling, new adventure activity of paramotoring. Consumption of alcohol, drugs, tobacco products and cigarettes is strictly prohibited during the activity. Travellers are required to follow instructions of the paramotoring pilot during the activity. For any cancellations made to the Vizag paramotoring trip: no refunds. In case of no show: no refunds. Paramotoring in Vizag is operational in two time slots during the day: 06:00-09:30 hrs and 15:30-18:30 hrs. Travellers are expected to arrive at the take-off spot a minimum of 20 minutes before the time slot. Paramotoring is a weather and wind-based adventure sport. In case the activity is cancelled due to bad weather or wind, travellers can reschedule the activity to an available time slot within the next 15 days. The tour operator takes utmost care to ensure safety of the travellers and shall not be held responsible for any mishap, accident or loss of life while paramotoring in Vizag. The tour operator reserves the right to cancel or alter the itinerary of this Vizag paramotoring trip depending upon weather conditions and other factors. If extra costs are incurred due to changes in the itinerary, they will be borne by the traveller. 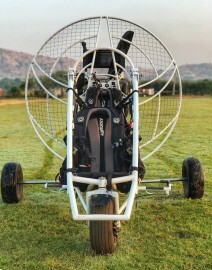 There is no pick-up for this Vizag paramotoring trip. There is no drop-off for this Vizag paramotoring trip. Arrive at the Rushikonda beach in Vizag about 20 minutes before your time slot. Paramotoring in Vizag takes place in two time slots: 06:00-09:30 hrs and 15:30-18:00 hrs. Once you reach, you'll fill out some paperwork, undergo a quick briefing and then head out for your tandem paragmotoring flight. For about 10 mins, you'll fly over the beach and the ocean, looking at the city on the horizon and the beautiful landscapes below you. The paramotoring pilot will safely land back at the beach. Your trip ends here. 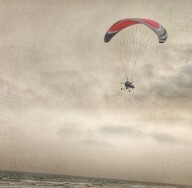 Go paramotoring in Vizag and fly over the Rushikonda Beach! 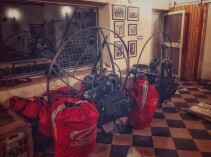 All equipment required for paramotoring: safety harness, helmet, glider etc. 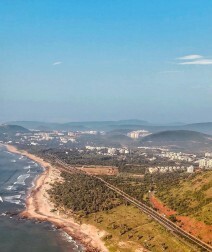 Visakhapatnam, or Vizag, is well-connected to most major towns of the country via frequent trains to the Visakhapatnam railway station and flights to the Visakhapatnam international airport. You can board a train to the railway station or flight to the airport and travel to Rushikonda beach in hired private cab/taxi. The beach is located 1-hr drive away from the railway station and the airport.